On May 11, the 10th Ministerial meeting started in Fairbanks, Alaska. The meeting adopted a final document entitled 'the Fairbanks Declaration'. The Declaration stresses the desire of the Arctic nations for peace, stability and constructive interaction in the region. 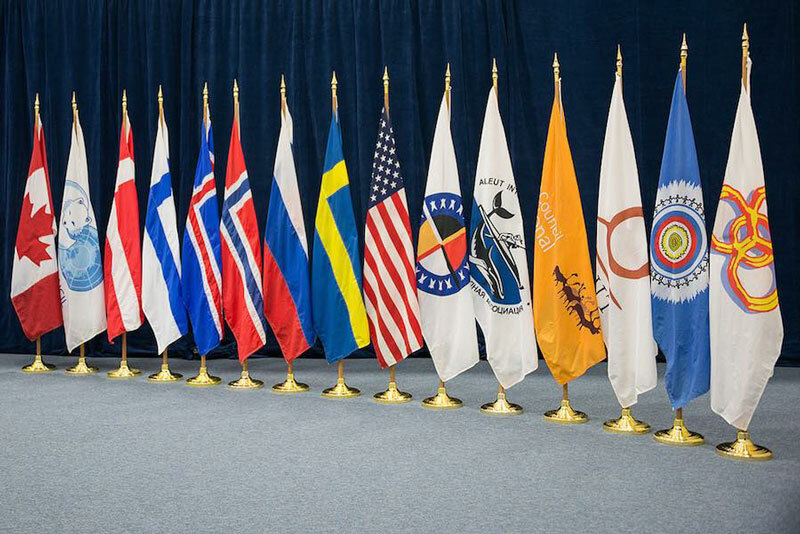 The signed agreement commits members of the Arctic Council to pay close attention to ecology and climate change monitoring, as well as, continue to solve social and economic problems of Arctic indigenous peoples. Particular attention was devoted to 'the Polar Code' aimed at ensuring safe shipping in the Arctic Circle. Despite the agreements reached on many humanitarian and ecological issues, there are still problems linked to the region's militarization, which the Arctic Council does not have the authority to resolve. Although the meeting of ministers was held in a friendly atmosphere, without any provocations, we should not underestimate the escalating tensions in the region because of military ambitions of various countries. For instance, the USA has not yet ratified the UN Convention on the Law of the Sea, signed in 1982. And this may aggravate the disputes over limiting boundaries in the Arctic Seas possible at any moment. It is also not clear how we can sustain the ecology and maintain international cooperation on environment and scientific research in the Arctic Circle if the States of the Arctic Council are actively militarizing the Arctic territories. For example, NATO Arctic Strategy exists since January, 2009, and serves to provoke the annual increase in the number of military equipment, units and troops in the Arctic. For instance, the Canadian military decided to increase its presence in the Arctic region and start the construction of necessary logistic infrastructure to that end. The Canadian Armed Forces Arctic Training Centre (CAF ATC) will switch to year-round operation. By early 2018, transportation hubs will be put into operation in Resolute Bay and Iqaluit (Frobisher Bay). And they will be capable of ensuring quick deployment of Canadian military forces in the Arctic zone. By that time, a refueling point will also be created in Nanisivik for needs of the Royal Canadian Navy. In 2017, Canadians plan to build 6-8 patrol frigates for keeping the watch in the Arctic waters. Moreover, after 2020, they are going to obtain 65 F-35 fighter planes for protection of the country's airspace against invasion. Currently, 15 combat vessels and 4 Victoria-class submarines are used by Canada for maritime patrolling. The Canadian Coast Guard forces are also serving in the Arctic. They are equipped with 5 large and 6 small icebreakers. In cooperation with Denmark, Canada plans to create units for an effective response to acute emergencies in the Arctic zone. The US Defense officials also see the Arctic as their high priority zone. On May 3, Commandant of the US Coast Guard Paul Zukunft lamented that the USA had only two icebreakers. And in addition to the construction of maritime vessels, Americans introduced 'a road map' to develop their Arctic territories. It includes the creation of a tactical large unit focusing on climate change monitoring through conducting maritime operations and military science research, as well as, increasing build-ups of military satellite fleet, pointed at the Arctic. Moreover, the US nuclear submarine force expands its presence in the Barents Sea; training maneuvers of the US Navy have become more frequent in the Chukchi Sea. Properly speaking, the US Navy is acting in the interests of American, Canadian and European oil producers. The fact that the Arctic is defined as strategically important region for NATO countries has led to expanding coverage of the Atlantic Alliance activities beyond the North Atlantic region's borders. NATO's Cold Response Exercise is conducted annually and involves military personnel of Air, Naval, Ground and Special Forces of NATO member-countries. NATO States are actively working out their national Arctic strategies. For example, Norway is the only country in the world which has its permanent military headquarters above the Arctic Circle. In 2017, Norwegian authorities announced the stationing of 330 US soldiers on their soil. The Norwegians also plan to replace 60 F-16 warplanes with 56 F-35 combat aircraft. Norway supports an increased share of the Arctic for NATO's plans and actively lobbies the concept of creating a sensitive security zone for 5 Scandinavian countries (Denmark, Island, Norway, Finland and Sweden) to strengthen their positions in the Arctic Circle. Denmark tries to keep up with Norway, being in the process of establishing the universal Arctic Command and Arctic Response Force. It is also planning to deploy a military base and command center within the Arctic Circle. In 2017, the Danes will build the third Knud Rasmussen-class patrol vessel, designed for operating in Arctic ice-covered waters. A major military exercise known as 'Loyal Arrow' is regularly conducted in Sweden. 10 NATO and non-NATO countries (Finland and Sweden) are participating in the exercise. From 6 to 15 March, 2017, NATO held large-scale maneuvers organized within the framework of Exercise Joint Viking in the north of Norway. 8,000 troops participated there, including 700 soldiers from the US Marine Corps, US Army and the British Royal Marines. Joint operation of aircraft, ships, submarines and armored vehicles were practiced 'in challenging Arctic conditions'. The next NATO exercise called 'Arctic Challenge' will take place from 22 May to 2 June, 2017, in Rovaniemi (Finland). It will involve more than 100 aircraft from 12 nations. Finnish civil society organizations have already held protests against these exercises, considering that the latter violate the provisions of the Paris Peace Treaties, 1947, and may be a basis of military tension in the region. Thus, settlement of many conflict situations is delayed, and uncontrolled militarization of the region continues as discussion of military aspects is outside of the Arctic Council's competence. To all seeming, such a scenario is beneficial to NATO countries that are, on the one hand, demonstrating their concern about the problems facing the Arctic and solidarity to partners and representatives of indigenous minorities lived in these northern territories, but simultaneously continue to pursue their aggressive policy. And in the end, the Arctic turns into a proving ground for military tests and large-scale exercises. Accordingly, the Alaska ministerial meeting, as well as, the handover of the Arctic Council Presidency to Finland give no security assurances to anybody in the Arctic and do not reduce the risk of new conflicts between countries, which sooner or later puts into question realization of recent humanitarian initiatives, announced in Fairbanks. (2297) & putin's(put-it-in) russia is trying to resurrect old abandoned high latitude military bases with huge quantities of pollution in barrels (& spilled). Yeah, ussr russia polluted lots of bases, inside & outside russia at lower latitudes, too. Poland, after the fall of the ussr, has regions that are considered the most polluted in the world. If the military believe that the arctic areas might be more accessible to the world's navy's there's no reason for them not to plan on possible attacks on that front. It is the job of the military to be ready for anything no matter how unlikely. Don't you think that having ice breakers in and around the Northwest Passage is a good idea? Let's remember that these ice breakers have helped shipping from all nations. Monitoring the climate of the arctic regions is totally different from proclaiming that man is ruining the climate. We MAY be having a continuing warm period and the effects of that could be far reaching and most assuredly should be watched. Actually the more things like this the better. Do you think that the shared responsibility of the International Space Station has helped or hurt relations with all of the countries involved? (1285) Is there a point to this thread? I don't think so. Apparently this article is "proof" that there's global warming. Cause the military is taking steps to protect northern borders if the ice melts. "old sick silly sleepy sleezy slimy steenkin' filthy vile reprobate rooting (& rotting) racist pukey proud pig AGW denier liar whiner wake-me-up" woofs: Apparently this article is "proof" that there's global warming. Cause the military is taking steps to protect northern borders if the ice melts. Presently, the Arctic sea ice IS ~ 10,000+ cubic kilometers less than that of the same average date of 1980's years. This volume of ice is equivalent to ~ 23kilometers by 23kilometers by 74000 feet high. ~ 35 times the annual energy consumption of the U.S. would be needed to melt it. All this melt despite 388+ straight months over the 20th century average AND the solar TSI being languid for decades, & low for 10+ years (including 3+ years setting a 100 year record low TSI). "old sick silly sleepy sleezy slimy steenkin' filthy vile reprobate rooting (& rotting) racist pukey proud pig AGW denier liar whiner wake-me-up" lies with alacrity. Presently, the Arctic sea ice IS ~ 10,000+ cubic kilometers less than that of the same average date of 1980's years. Sea ice extent hasn't been measurable save for the last 50 years. Your fear of the unknown is funny. It is known only by word of mouth that there have been years when the Northwest Passage was completely open implying that the arctic sea ice extent was less than today. Ships would travel to China from Europe through the Northwest Passage. In 1958 the North Pole was clear of ice. The USS Skate surfaced in clear water IN MARCH when the ice should have been near it's thickest since that is shortly after the sun peaks above the horizon. In 1959 the ice at the North Pole was so thin that the USS Nautilus surfaced like the USS Skate did in open water the year before. But I'm sure our foul mouth Indian friend who even the worst global warming defender hates knows more than the real world science. After all we all can see how brilliant he is. "old sick silly sleepy sleezy slimy steenkin' filthy vile reprobate rooting (& rotting) racist pukey proud pig AGW denier liar whiner wake-me-up" woofed:In 1958 the North Pole was clear of ice. The USS Skate surfaced in clear water IN MARCH when the ice should have been near it's thickest since that is shortly after the sun peaks above the horizon. In 1959 the ice at the North Pole was so thin that the USS Nautilus surfaced like the USS Skate did in open water the year before. "Surface at the Pole: The Extraordinary Voyages of the USS Skate," where Calvert said, "Seldom had the ice seemed so heavy and so thick as it did in the immediate vicinity of the pole. For days we had searched in vain for a suitable opening to surface in." The closest was to make radio contact at the surface from a polynya around 30 nm away, but not to surface fully owing to the risk of damage from ice. Skate did manage to surface and make contact with Drifting Ice Station Alpha at 85ºN, 300 nm away. As of recent years, even sea doos, entering the Arctic seas from the Bering Strait, have worked their way thru the entire Alaskan Arctic waters & only been stopped after exploring a fair west to east portion of the High Arctic Canadian mainland AND EVEN INTO PARTS OF THE CANADIAN ARCHIPELAGO. As many AGW denier liar whiners have done in the past, "old sick silly sleepy sleezy slimy steenkin' filthy vile reprobate rooting (& rotting) racist pukey proud pig AGW denier liar whiner wake-me-up" makes past explorations of the Arctic appear to be cakewalks. But past explorations of the High Arctic have been dangerous & at times, Arctic conditions repulse the most valiant efforts. Another clown act from the Prince of Fools. "wake" & the other AGW denier liar whiner waifs pretend their stories of surfacing submarines show less Arctic sea ice before the 80's. Of course, there wasn't, as closer examinations of submarine logs indicate.